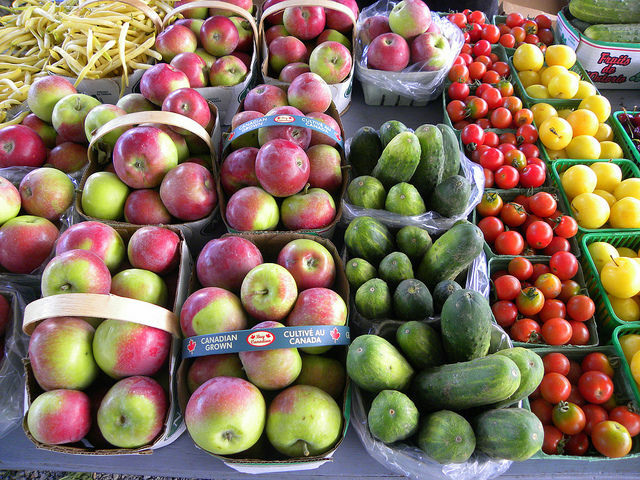 Eat your way across Canada from farmers market to farmers market for a fun, delicious trip. You could practice the 50-Mile Diet because the farmers market is within 50 miles (80 kilometres) of your home on wheels. You may want to consider farmers markets as a way to offset your travel costs. Markets are a marvelous way to get a feel for the area, meet the people and enjoy fresh, often organic food. Most markets insist on the “Make it, bake it, grow it” principle but some provinces allow a percentage of other commercially produced home-based businesses such as J.R. Watkins products. Since 2003, we’ve sold driftwood, shells, jewelry, books and brandied blackberry sauce at farmers markets in nine provinces and two territories. 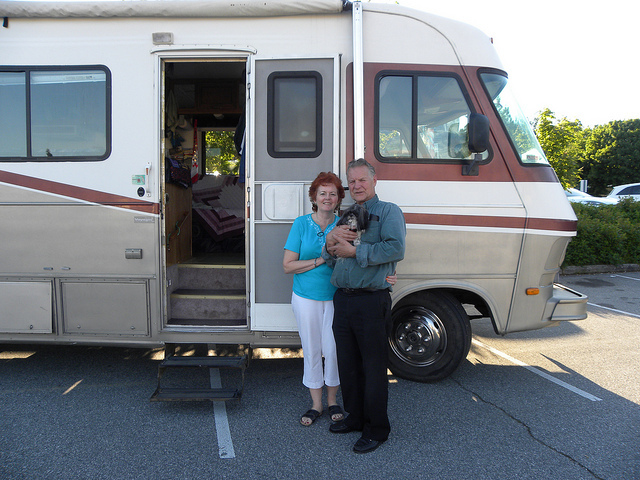 We’ve since downsized to a 24-foot C-Class RV and narrowed our stock to jewelry and books. Come with Dave and me to a few of our favourite markets as we eat our way from Powell River, British Columbia, to St. John’s, Newfoundland. The Powell River Farmers Market is held on Saturdays (from 10:30 a.m. to 12:30 p.m.) and Sundays (from 12:30 p.m. to 2:30 p.m.) from May to September. It is located at the Exhibition Grounds on McLeod Road on forested land with barns, a bandshell and booths selling local products. Sounds of music, children’s laughter and, on Sundays, train rides fill the air. They’re serious about supporting sustainable practices. The Beaverlodge Farmers Market at the fairgrounds inside the Ag-Complex is open year-round on Tuesdays (from 5 to 8 p.m.) and Wednesdays (from noon to 3 p.m.). What sets this one apart is Amiga’s Kitchen where the best roast pork dinner like Mom made costs only $7. Alberta Beach hugs the shores of Lac Ste. Anne. It started in 1912 when the Alberta Northern Rail built a railroad from Edmonton to what is now Alberta Beach which became a summertime destination. Today the Alberta Beach Farmers' Market spills out of the Agriplex to the outside and runs from May to September on Sundays (from noon to 3 p.m.). Farm trucks loaded with produce, crafts, bedding plants in season and tantalizing aromas of barbecued farm sausage filled our senses. There is a campground in town. The Red Market Barn in Kenosee Lake is a 100-year-old farmers, flea and antique market. It is held on Sundays from May to September. North of Gimli on Route 222, we came upon the Arnes Farmers' Market. 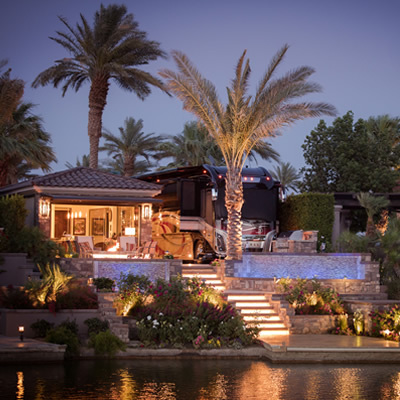 Dennis Bobrovich created a market on his family farm. Bunny pens, pigs, chickens and cows are part of it. Ducks waddled along behind Dennis as he whistled. It felt like a country fair with pizza from a wood-fired oven. 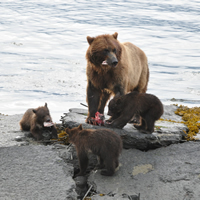 It’s open Saturdays (from 9 a.m. to 2 p.m.) and Sundays (from 10 a.m. to 2 p.m.) May to October. The Morden Farmers' Market, spread over a couple of downtown blocks, runs Thursdays (from 4 to 6 p.m.) from June to October. 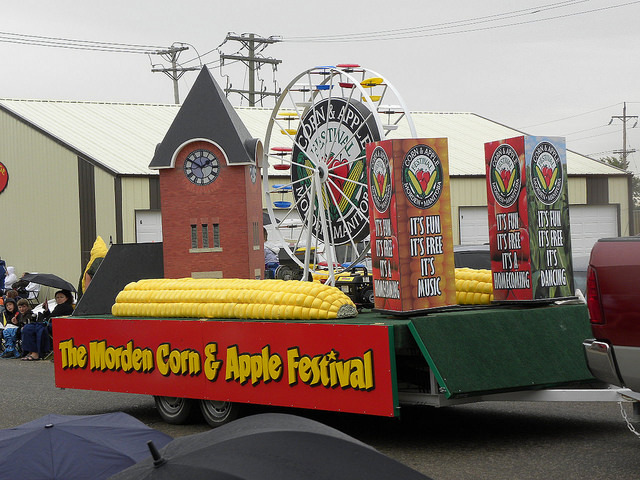 The giant extension of it is the Morden Corn and Apple Festival, which takes over the downtown core. The operative word is FREE: 75,000 cobs of free corn, free apple cider, free stage shows, free shuttle and free parking. This tiny town of about 4,500 people draws crowds of over 60,000. There’s a campground and overflow camping on the school grounds. Our travels through Ontario selling at the markets have resulted in many friends. We’ve met the nicest people while selling in North Bay, Sudbury, Huntsville, Bracebridge, Kemptville, Brockville and Prescott. They all share a commonality: farm fresh food and fun. The Thunder Bay Country Market in the Dove Building on the CLE grounds has over 80 vendors sells everything from farm produce to commercial products. And that includes "oh-so-delicious" breakfasts made with organic food! It is held Saturdays (from 8 a.m. to 1 p.m.). The Maritimes hold a special place in our hearts for the scenery, ocean, music, people and fabulous food. The Marché Moncton Market is a gigantic year-round market in its own building in the heart of the downtown. Vendors have permanent spots and are open Saturdays (from 7 a.m. to 2 p.m.). Restaurants offer a diverse selection of food. Farmers bring in their goods from as far away as Prince Edward Island. The day we were there the annual accordion festival filled our ears with foot-stomping tunes. Thousands of people streamed through the building. Shediac, home of the giant lobster, also has the huge Shediac Park Market, held in the Pascal Poirier Park on Sundays (from 9 a.m. to 2 p.m.) from June to September. While the Truro Farmers' Market in its own building was bigger than the Amherst Farmers' Market held in the Lion's Hall, we really enjoyed the intimacy of Amherst. They didn’t charge us for the table, plus gave us gifts—you've got to love Down East hospitality. 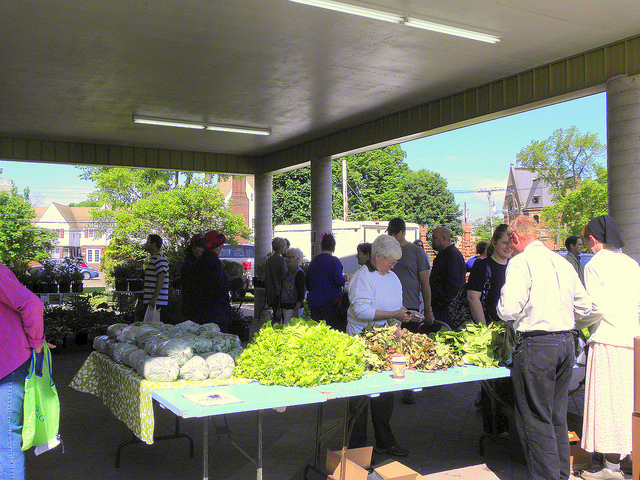 The Amherst market is held on Fridays (from 10 a.m. to 2 p.m.) from April to June. Once you cross the 13-kilometre-long Confederation Bridge, you are in a pastoral countryside of red clay and rich history. The Charlottetown Farmers' Market is open June to Thanksgiving in its own building on Belvedere Avenue. We set up our tent outside beside a lady making giant bubbles. On a good day, she can make one big enough to cover a car. The market is open Wednesdays (from 9 a.m. to 2 p.m.). 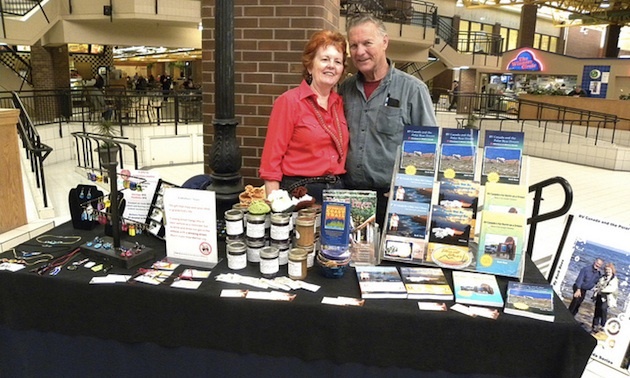 A 16-hour ferry ride and 8,189 kilometres (5,088 miles) later, we were the vendors who’d come the farthest to sell at the St. John’s Farmers' Market on June 29, 2013. Produce wouldn’t start appearing till later in July, so it was mostly crafts, canning and meals. The market takes place in the Lion's Club Chalet on Saturdays (from 9 a.m. to 2 p.m.) from June to December. In 2009, we explored "north of 60" where selling at the Fireweed Community Market in Whitehorse put us in touch with the culture of the north. Did you know that Elvis is a carver? This market is open Thursdays (from 3 to 8 p.m.) and Saturdays (from 10 a.m. to 2 p.m.). The Northwest Territories has only one "farmers market," the Fisherman’s Wharf Market in Hay River. We bought fresh mariah, a cod-like fish also called coney, and deep-fried pickerel fins. For a good feed of fish, stop in Hay River. There were no fast-food restaurants. Eating from farmers markets is not just healthier but we meet the person who grew or made the food we are eating. Next time you travel, feed your body and soul at a farmers market. The warm April air was a promise of spring and new beginnings. At this time of year, flower bulbs planted in the fall were in bloom and these RVers wanted to experience the fields of colour.